Yes, the title is as provocative as the text found inside the 177 pages crafted as a conversation between both activists; one serving a life sentence in Waynesburg, PA and the other an Ivy League professor sharing his knowledge with the educational elite. If the title alone does not grab your attention, or at the very least, shed light on the dark realities of the school to prison pipeline; then find comfort in knowing that asha bandele’s fingerprints have touched this piece as well – as editor. Abu-Jamal and Lamont Hill take on the discourse so many African Americans engage in, yet so few human beings have any insight unto – which instills a blindness to the indifference that still persists. Each chapter is dedicated to components of the African American experience that are real, raw, and in dire need of attention. 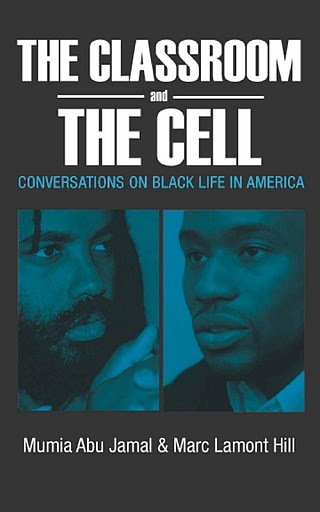 In bringing necessary awareness to the issues, concerns, and realities found within this piece, take a look at Marc Lamont Hill on the creation of The Classroom and The Cell. Mumia: When you talk about your lack of freedom, you’re talking about the golden chains that are on you. They’re pretty as a [expletive], but they’re still chains. I think it’s interesting that our people, of all the people in the world, chose chains as a fashion accessory. Mumia: Damn! Whips and chains. That ain’t a Freudian slip. Ain’t no such thing! We’re not even free in our language. You dig what I’m saying? This excerpt sets the tone for the entire piece; it’s no wonder that I have felt compelled and propelled to research both men in greater detail. This is also the excerpt I read aloud to students when they ask what I’m reading. And every time, without skipping a beat, students are viscerally moved by it. They ask to sign it out; immediately. Some students are so enamored by the text, craft, and connection that they find an urge to read other books also authored by these men. Innately what happens next is stunning – author studies are being explored and students’ identities are being validated. What titles do you and your students collectively enjoy that provide opportunities for understanding cultural ideologies while fostering honest dialogue?